A man who killed his father and severely beat his mother during a psychotic episode in November had abandoned medical treatment for a mental health vitamin pill shortly before his death, a B.C. court has heard. Jordan Ramsay, 27, is on trial to determine if he is criminally responsible for the second-degree murder of his father, Donald Ramsay, and the attempted murder of his mother, Wendy Ramsay. B.C. Supreme Court heard Wednesday that Ramsay had a long history of getting off his medications before trying the EMPower Plus vitamins from Truehope, which are manufactured by an Alberta company and advertise a nutrition-based way to improve mental health. “It’s awful. My family is just devastated by this,” LeeAnn Ramsay, Jordan Ramsay’s aunt, said outside the court. Police say the Ramsays were beaten with a hammer or a wrench. Shortly before the attack, Ramsay appeared not to recognize his mother, the court heard. When police arrived, Ramsay was combative and had to be subdued with a Taser. Ramsay has admitted to his actions, but pleaded not criminally responsible. 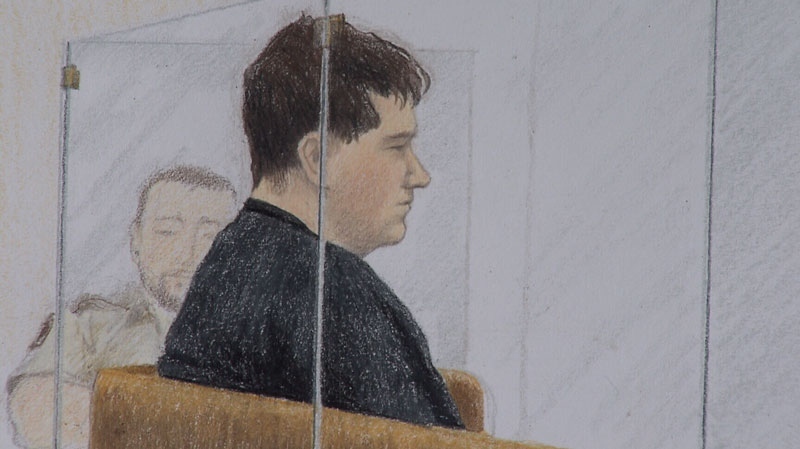 The court heard evidence from psychiatrist Leanne Meldrum, who said that Ramsay stabilized with doses of Risperidone, but relapsed when he stopped taking the pills. She told the court that Ramsay’s parents believed the best path for him was to take fewer doses of medication. “Ms. Ramsay had been trying to keep him on the lowest dose,” Ramsay’s lawyer, Dan Sudeyko, read from a psychiatric report Wednesday. When officials searched the Ramsay house after the murder, the court heard that they did not find any Risperidone -- only Truehope pills. “No prescription meds had been found,” said LeeAnn Ramsay outside of court. Truehope is an Alberta company co-founded by Anthony Stephan, a man whose wife committed suicide after a struggle with bipolar disorder and whose children have faced more mental illness. A pig farmer, Stephan saw a similarity between his children’s mental health problems and a pig with ear-and-tail-biting syndrome. The pig syndrome is treated with nutritional supplements, so Stephan and his colleague David L. Hardy created a human version. They say that the benefits of the substance are borne out in peer-reviewed studies. “We’re not applying a medication, we’re applying proper nutrition,” Stephan says in a video on the vitamin company’s website. The company has tangled with Health Canada over whether the pill is marketed as a treatment, which must meet a high bar for medical proof, or just as a supplement. Going off medication is very dangerous for patients, said Vancouver psychiatrist Dr. Phillip Long. In an interview, Stephan denied that his company tells patients to use vitamins instead of drugs. “I’m not saying that it’s a treatment for schizophrenia or bipolar disease. I’m saying that people have used it and found it effective,” he said. “The mother was working with us,” he said. LeeAnn Ramsay said she doesn’t fault Wendy for trying to get her son the best treatment. Jordan Ramsay is currently a patient in Coquitlam’s Forensic Psychiatric Institute. Wendy Ramsay is out of hospital but is still recovering from her injuries.